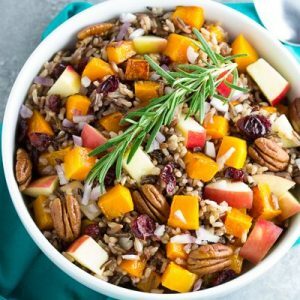 This Roasted Butternut Squash and Wild Rice Salad is an easy side dish for all of your holiday meals! Hello again, friends! I am so excited to be sharing another healthy recipe with all of you! This month, with it being November, I wanted to create an easy side dish that you can make for your upcoming holiday celebrations. 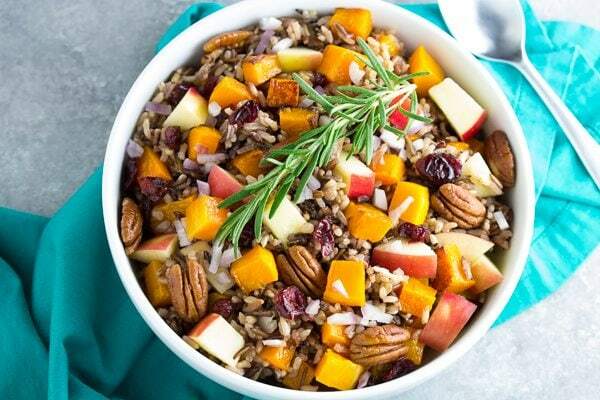 This Roasted Butternut Squash and Wild Rice Salad is just bursting with colors, flavors and textures! Besides the summer months, this time of year is my favorite when it comes to food. And one of my very favorite fall foods is butternut squash. It’s extremely versatile, and it works in all sorts of dishes from soups and stews to pasta dishes and salads. Have you tried roasted butternut squash? It’s a must this time of year. I love butternut squash because of its creamy texture, and roasting it brings out that texture even more. The edges that get all toasty and caramelized are the best part! This salad is easy to make, which makes it a great addition to your holiday meal. With so many dishes to prepare, quick and easy sides are a must! 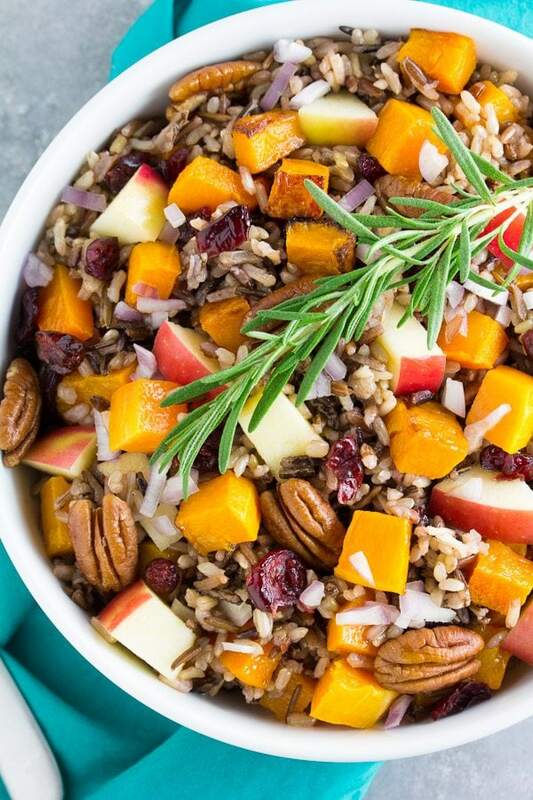 To make this Roasted Butternut Squash and Wild Rice Salad, you’ll first want to get your wild rice cooking on the stove. Once that’s going, you can prep your squash for roasting. 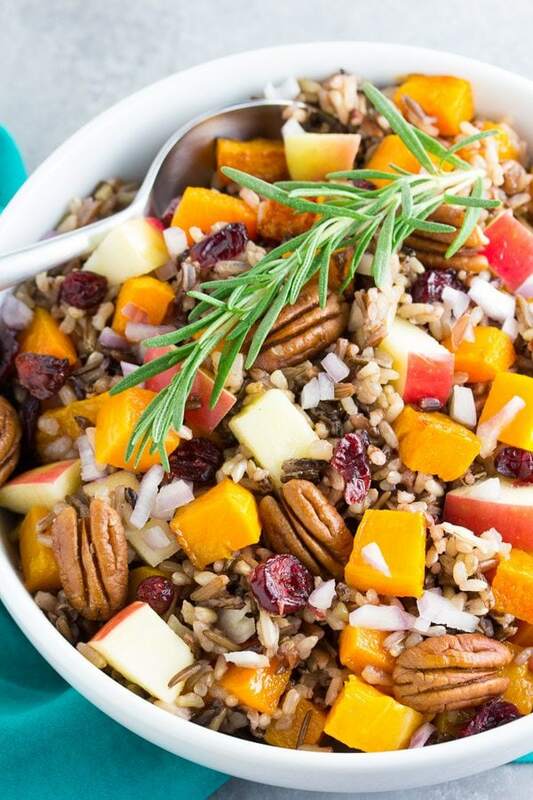 Once the rice and squash are cooked, you’ll add toasted pecans, apple pieces, dried cranberries and shallots. I’ve created a simple apple cider vinaigrette as the dressing for this salad. You don’t need too much dressing, so that the flavors of the roasted squash and other salad ingredients can shine. You can serve this salad warm, chilled, or at room temperature. It’s even better the second and third day, so you can save time by making it ahead. Enjoy! Place water and rice in a medium saucepan and bring to a boil. Cover, reduce heat to a low simmer, and cook for 40 to 45 minutes until water is absorbed. Remove from heat and let stand for 10 minutes with the lid still on. Fluff with a fork. Meanwhile, preheat oven to 425 degrees F. Place butternut squash on a rimmed baking sheet and toss with the 1 1/2 tablespoons of olive oil. Roast in the preheated oven for 35 to 40 minutes, turning once halfway through, until tender. Toast the pecans by placing them in a small skillet over medium heat until fragrant. Watch them closely as they can go from toasted to burnt quickly. 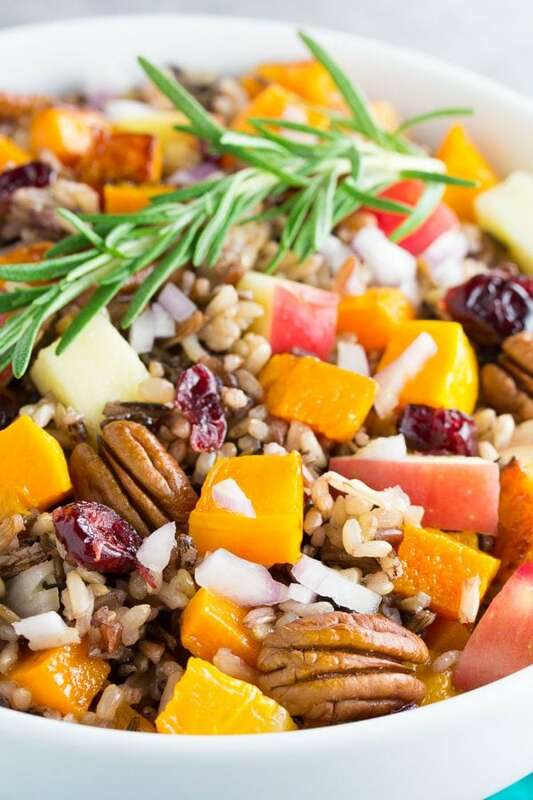 In a large bowl, combine the cooked rice, roasted squash, toasted pecans, apple pieces, dried cranberries, and shallot. In a small bowl, whisk together all dressing ingredients. Pour dressing over the salad and toss gently to combine. Salad can be served warm, at room temperature, or chilled. Garnish with fresh rosemary, if desired.